If you had recently jailbroken your iOS device using the new TaiG 2.0 jailbreak, you probably have been stuck with a non-functional Cydia. Not anymore, as Saurik has updated Cydia Installer to fully support iOS 8.3. 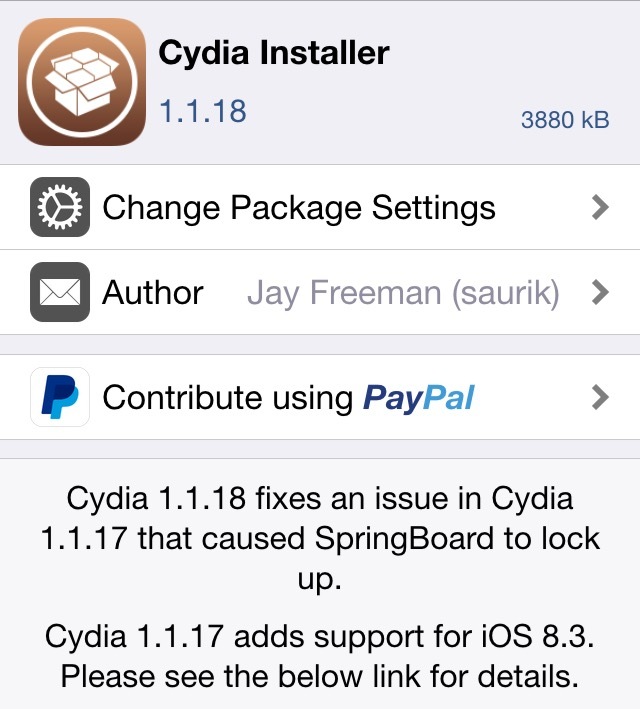 Late last week, Saurik released the first update to Cydia Installer, bumping the version to 1.1.17 and bringing several bug fixes and support for iOS 8.3. However, version 1.1.17 didn’t play along well with TaiG’s iOS 8.3 jailbreak and Saurik released another update to Cydia Installer. A “proactive” fix for iOS 8.3 added in Cydia 1.1.17 caused SpringBoard to loop up if users killed Cydia using the iOS task switcher. This fix is designed to fix an issue that should be present on iOS 8.3, but TaiG’s jailbreak seems to provide a workaround in the form of a kernel patch. This will be investigated for later releases, but in the mean time the fix has been removed. To install the latest version of Cydia, you simply have to launch Cydia and wait for it to load. You will then receive a notification that’ll prompt you to upgrade Cydia and the latest 1.1.18 version will be installed.